Elsa (left) and Ariel (right) by Sakimichan. Elsa has never looked better, and we have one digital artist to thank – Sakimichan. 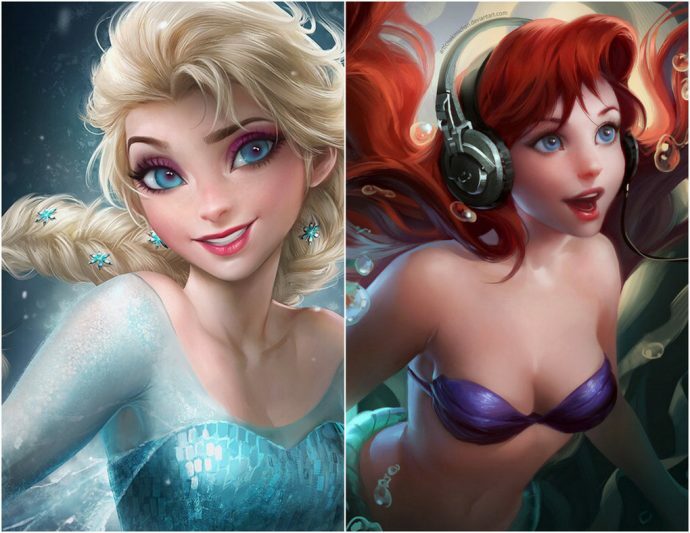 Heading to STGCC 2016, the talented 25-year-old digital artist from Canada will be delighting fans with her highly detailed digital portraits and dreamlike depictions of our favourite Disney and comic characters. Her work speaks for itself, but let’s learn a little more about her before the big event! Your digital art is amazing. I love how vivid and dynamic they all are! Have you studied art or were you self-taught? Also, how did you develop your unique style? I was self-taught at the start but I did receive guidance when I was in college from some of my teachers as well as when I worked for game companies. Though I can say that however far you get is determined by how hard you work at it. I guess I got my style by experimenting a lot. I remember times where I spend 24 hrs without sleeping on trying to paint something I thought was “ok”, I’m very picky when it comes to my own work. You’ve mentioned that you’ve been drawing since you were a kid! Have you always envisioned being a world-famous digital artist today? I do post a lot online, but world famous is such very flattering way to say it ! I never expected to be where I am today, but I do appreciate all the support and I love to make others happy with what I love to do! 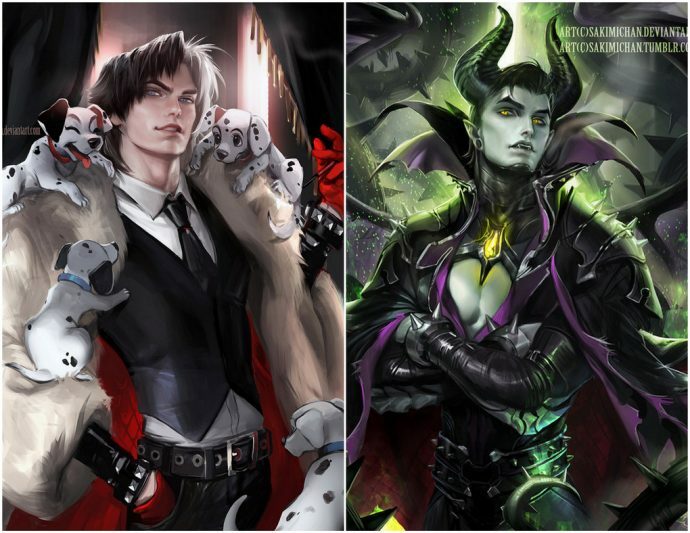 Male versions of Cruella (left) and Maleficent (right) by Sakimichan. Your gender-bends pieces based on characters from pop-culture (western, anime, games etc). What’s the creative process when it comes to designing them, because the character designs are so on-point! I usually just try to stay true to the original design and look. I also try to paint what appeals to me. How do you feel about using Patreon? 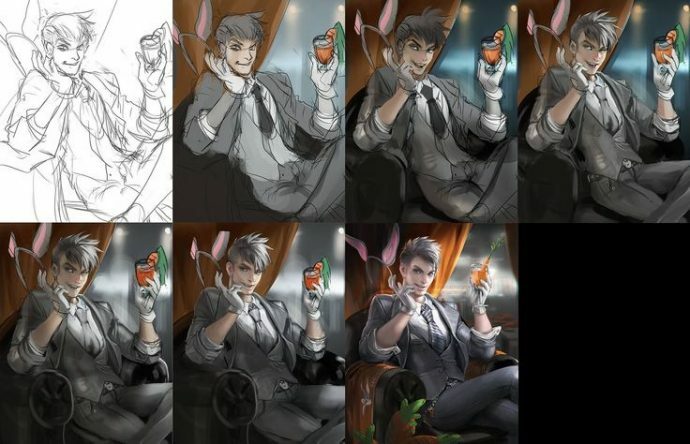 I feel that it gives the artist more interactions with their fans, and your tutorials have been more than helpful to aspiring artists out there. Patreon is a great website for artist and fans to interact, fans can support their favorite artist/creator and creator can create and share the content with their fans, I own a lot to my fans who support me and patreon for creating their website. I feel like I’ve improved a lot of my process for painting while on patreon. What do you carry on you for work or when inspiration hits on-the- go? I mostly work from home now, but back when I was in college and commuting between my full-time job ( 3 hours each day, back and forth), I always had an anatomy book with me and I would sketch anatomy studies from the book. After I get home I would then paint digitally, it was a good combo. Any words of encouragement for your fans and fellow artists out there? I think it’s all about practice, but that’s an obvious advice. I do recall a better advice my teacher gave us. “For every 1000 paintings you create, only one of them will be a master piece.” It goes to show how much work it might take for you to achieve your goals, but I like the message behind it. We would like to thank Sakimichan for taking time out to talk to us, and can’t wait to see you at STGCC 2016 proper!